Wash, hull, and quarter the strawberries and place into a serving bowl. Toss the berries with the sugar. Adjust the sweetness level according to the quality of the berries. Allow the berries to sit for at least 30 minutes. 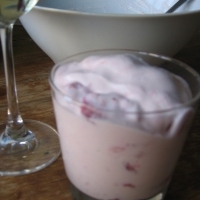 Just before serving, fold in the quark, stirring well to evenly incorporate the berry juices. oh, now i'm craving this... haven't had it in years!